1. There’s an unpleasant smell. 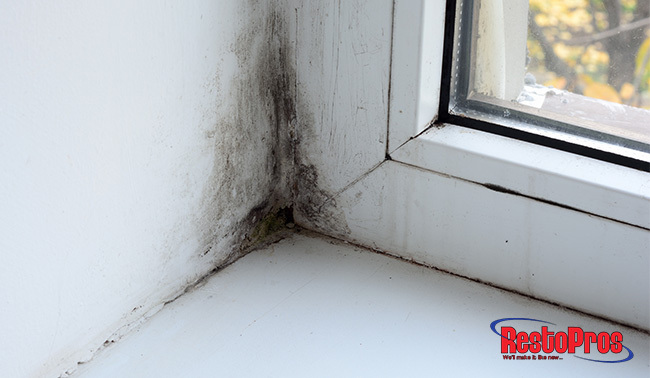 A damp, musty smell is often an indication that mold is present. Due to the nature of mold, you won’t always see it right away, but you can smell it. While diffusing essential oils might help mask the odor, it won’t get rid of the problem. The unpleasant odor is caused by microbial VOC’s (volatile organic compounds), and the side effects of exposure include headaches, dizziness, fatigue, nausea and skin irritation. Here’s the problem with just smelling mold: if you can’t see it, you don’t know where to start in the remediation process. In this case, we recommend hiring an expert to help you locate the source, as it could very well be in an area that’s not easily accessible, such as your crawlspace, ductwork, or attic. 2. There are small specs of a dirt-like substance. It’s possible for mold to be visible but for you not to know it. This is because mold can appear in a variety of colors and sizes. It can even be as small as specs of dirt. And, if ignored, a small patch of mold can quickly become a serious issue. The area is damp and dark. The substance doesn’t wipe away easily. It has a velvety appearance. There’s a foul odor accompanying it. 3. The walls have discoloration. Mold thrives in moist areas. Pay special attention to areas in your home with higher moisture levels, like your bathrooms, kitchen, and basement. Look for splotches and discoloration at the top of the ceiling, down close to the floor, and along baseboards. 4. You have surface damage. If your flooring, wall paper, or paint is peeling or curling, or if there are surface stains, it could be an indication that you have mold. Check to see if the area is wet or damp. While mold and mildew are both fungi, mildew isn’t as dangerous. However, both should still be addressed immediately. This grayish-white, powdery substance lives on surfaces and can be found in the corners of showers, on shower curtains, and on bathroom tiles. Unlike mold, mildew is easier to eliminate. To clean mildew, combine 1 gallon of water with ¾ cup of bleach, or if you’d prefer not to use bleach, fill a spray bottle with distilled vinegar. How you go about treating mold depends on the type and extent of the growth. If treated in the beginning stages (limited to an area of 10-square-feet) you can often clean the area using household products such as bleach, ammonia, vinegar, or hydrogen peroxide. When the growth is extensive, we recommend calling a professional right away. At RestoPros, we use proven methods and industry-leading equipment to effectively remove mold from your home and prevent it from returning. Our comprehensive remediation process will restore your comfort, safety and peace of mind. The professionals at RestoPros are the experts in mold removal and prevention. For high-quality service you can depend on, call (855) 587-3786 today! We proudly offer 24-Hour Emergency Service.